Every home should have their own little lucky leprechaun, who knows what good luck and fortune my befall you? A happy little Lucky Leprechaun to bring you good cheer and happiness, small enough to stand on any shelf and watch over you, and strong enough to become your treasured family heirloom! What a fascinating and unique talking point he is, he is absolutely the only one of his kind IN THE WORLD. As part of Irish mythology and folklore, the Leprechauns are part of our faerie folk, called by some as the “The Wee Folk”. They are said to be small enough to sit comfortably on your shoulder, they are smartly dressed with waistcoats and buckles on their shoes and hats. They are mischievous little folk, but they are protective beings who love their owners and take care of them in any adversity and it is said that every Leprechaun has a pot of gold! This lucky little fellow has his very own stash of gold (pyrite), hidden inside his genuine Blue Wade Porcelain Whisky bottle. Our little fellow here has had a wonderful night out, he has been drinking his whisky, but is still very much smiling as he has not lost his stash of gold or his unopened tiny bottle of Whisky. 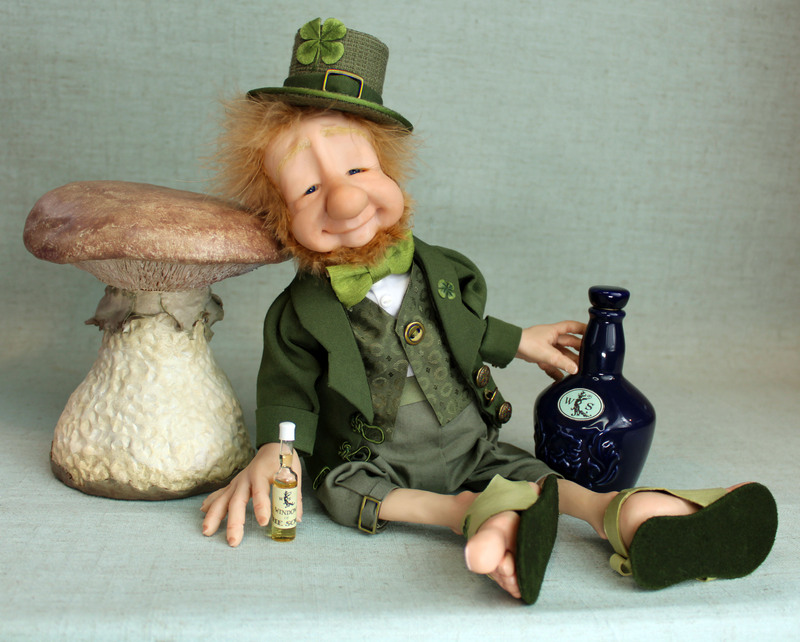 This lucky Irish Leprechaun measures a proud 36 cms (14.25 inches) from the base of his mushroom seat to the top of his hat, and 22 cms (8.75 inches) when he is sitting on a shelf or in your hands. His handmade mushroom is 14 cms (5.5 inches) and has hidden magnets inside which holds him sitting on his seat perfectly. He is a polymer clay creation with weighted glass granules in his stockinette body, which allows you to arrange him in several poses. He is very soft and squashy and can bend at his waist. His arms and legs can bend and his wobbly head can turn from side to side. His arms and legs are floppy and dangle, just like a real little drunk man! Lucky Leprechauns can be given or acquired according to the spiritual necessity that each person has at that time. You may see a few, but there is always one who chooses their owners and makes you fall in love with them, if this happens to you, its because he has a mission to fulfil in your home. If you adopt a leprechaun, you will be filled with joy, the only care they require is love. He has such a gentle little beguiling face with the softest expression that will melt your heart and make you want to hug him. He has big fat removable shoes which dangle from his mushroom seat, you can choose to have his shoes on or off and his attire is pure linen, cottons, luxurious taffeta silks, hand embroidered buttonholes and metal buckles. His jacket and waistcoat are able to be opened and closed but they are attached so as not the be removed, I think he would prefer to keep his clothes and hat on! His bottle is a genuine blue Wade Porcelain Whisky bottle, with a removable blue porcelain covered cork stopper. Little Millington Green Leprechaun has his very own handmade lucky four leaf clover on his hat, and a tiny handmade one on the lapel of his jacket, and one on each of his shoes! I want every creation to leave my studio looking as close as can be to a real living person. Each of my models has been made using no moulds whatsoever and meticulously hand painted to bring the most amazing realistic skin tones possible. I only use the highest quality acrylic artist pigments, Genesis Heat Set paints, that will withstand the test of time. I use high grade Polymer Clay which is strong and durable, strong enough to last a lifetime! No detail has been overlooked and no expense spared, my creations are so special to me and I put endless time and love into them, and would never sell a product that was not top quality. I am so sure of the quality of this incredible little man, that I am giving a LIFETIME GUARANTEE. If ANYTHING, breaks or comes loose, no questions asked, just return him to me and I will fix him and return him to you for FREE, you just pay postage to get him to me. Even if this is MANY YEARS down the line, I want you to be able to enjoy him for a lifetime! I spend hour upon hour on every creation until it is perfect and has that “living glow”. No two models are ever the same, as every one is unique to themselves, and every one-of-a-kind sculpture will be bringing with them their own numbered and signed Certificate of Authenticity. This is a very rare opportunity to own one of these breathtaking little treasures. I always use UPS Worldwide, cost includes all shipping and insurance, it is included to ensure you receive your order as quickly and safely as possible. You will be provided with a tracking number for you to follow the progress of your new purchase as I want this to be the most successful transaction ever for you! This little man is the MOST beautiful thing! I adore him, that face, I can’t stop looking at him! You are by far the best at what you do….such talent and feeling. Thank you for creating such a fabulous little creature! Words just cannot express my delight in your work, just excellent! Fantastic, beautifully, delicately and obviously love crafted! This is amazing, beautifully made, WOW, lovely talented seller. A first class piece of work, I WILL buy again! It is splendid, I adore him, he is wonderful! A very rare and special talent. A wonderful work of art. An amazing talent. I couldn’t be happier and I love my Lucky Little Leprechaun.